Is there a hotel option for exhibitors who will need to travel? The conference committee has reserved a block of rooms at a hotel near the Irving Convention Center. Rooms will be available for conference attendees and exhibitors at the Omni Mandalay Hotel in Las Colinas. What is the set-up time for exhibitors? The exhibit hall is open for set-up between the hours of 12:00 P.M. and 4:00 P.M. on Tuesday, May 28, 2019 and on Friday morning between the hours of 6:00 and 7:00 a.m. Please confirm your set-up time by email to . **Please note the VIP Reception will begin in the Exhibit Hall on Tuesday, May 28, 2019 at 5 P.M. sharp. This is a fantastic opportunity to mingle with conference sponsors and other special guests. When does registration begin for the day of the conference? Registration for attendees opens at 6:45 A.M. and the first Keynote is at 8:00 A.M.
Where is the Exhibitor Hall and check-in? 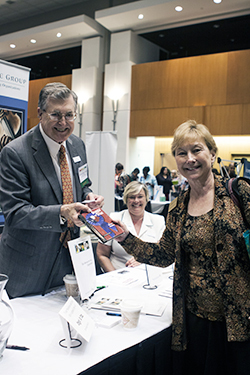 The Philanthropy in Action Conference will occupy the 3rd and 4th floors of the Irving Convention Center. Attendee check-in will be on the third floor, and Exhibitor/Sponsor check-in will be in the 4th Floor Exhibit Hall. You will receive your name badges and a conference schedule. What time should exhibitors arrive on Friday? All exhibitor booths must be manned and operational by 7:45 A.M. on Friday morning. Attendees to the conference will begin arriving at 6:45 A.M., so arriving a little earlier would be suggested so you are ready to talk to attendees. We strongly suggest completing set-up on Thursday afternoon. Coffee and light breakfast foods will be available Friday morning. What is the size and type of table and drape provided in each exhibitor booth? Tables in each exhibitor's location are 6' x 30" with a white tablecloth and black skirt. Displays cannot exceed the width of the booth. The footprint of the space cannot be exceeded into additional space. Are there guidelines for appropriate booth display? Make your booth stand out. An eye-catching booth attracts more traffic. Have a way to collect names. The Conference does not supply attendee contact lists. Giveaways always attract more traffic. Do not block the aisles or neighboring exhibitors. No signage is allowed on convention walls. No flashing lights, helium balloons, glass containers, food distribution, glitter or confetti are allowed. Also, it is the responsibility of each exhibitor to read the Irving Convention Center's Exhibitor Guide. Yes, the Irving Convention Center will provide free WIFI to exhibitors. If you need a hard-wired Internet connection, please contact the in-house A/V company JSAV at 972-401-7748 to order in advance. On-site requests may not be fulfilled and will incur a 20% premium. Will the booth be equipped with electricity? Some booths have easy access to basic outlets. You will see this clearly marked on map of the exhibit hall. If you need higher levels or additional power sources, please contact the in-house A/V company JSAV at 972-401-7748 to order in advance. On-site requests may not be fulfilled and will incur a 20% premium. May items be shipped to the Convention Center prior to the event? Packages may be shipped up to 3 days in advance with advance arrangements and payment of fees. Please contact Terrye Houser, Account Manager, Irving Convention Center at 972-401-7778 office OR 972-271-7888 fax OR . Incomplete requests may not be fulfilled and will incur a 20% or greater premium. Are there special instructions for loading and unloading? Move in and move out is through the loading docks only. They are located at the back of the Convention Center. Any booth supplies or freight should be transported to the third floor via freight elevators only. *Please Note: use of the loading docks should be scheduled in advance with the onsite provider JSAV. Contact: 972-401-7748 to order in advance. On-site requests may not be fulfilled and will incur a 20% premium. *Exhibitors are responsible for arranging use of any supplies such as hand-trucks or moving dollies. Is Food and Beverage allowed at the Exhibit Tables? Exhibitors are welcome to keep a personal water bottle or coffee at a booth. However, Irving Conference Center does not permit any food or beverage items to be distributed to conference attendees, for examples- branded candy bars or water bottles. Violating this guideline will incur a penalty fee and a request to immediately remove items. Are there special events built into the schedule to drive attendees to the Exhibitor Hall? The VIP Reception takes place in the Exhibit Hall at 5 P.M. on Tuesday, May 28th. Coffee and pastries are served in the Exhibit Hall to make this location the first stop for attendees Friday morning. Afternoon drinks and snacks will also be available for attendees in the Exhibit Hall. Attendees will be circulating through the exhibitor space before and after the keynote presentation and lunch hour. The Keynote Address and Lunch take place in the ballroom adjacent to the Exhibit Hall. In addition, there will be breaks scheduled throughout the day so attendees can visit the Exhibit Hall. Each attendee is offered the opportunity to win an amazing prize, which requires the signature of an exhibitor representative. Please make sure your booth is covered at all times so you can mark their "Exhibit Hall Pass." Will exhibitors be published on your conference website? Yes, confirmed exhibitors and sponsors are posted on the Conference website with links back to their website. Should an exhibitor provide a door prize? This is entirely up to you. Everyone knows the giveaways and door prizes attract attendees to your booth and this is a very easy way to collect business cards and contact information. During the last break of the conference, the Conference Committee will announce the winner of the drawing hosted by the conference, at this time you can draw from your container and we will announce the winners of your prize. Door prizes can be items from your company, a gift card to a restaurant or event, or a MasterCard/Visa/ Amex gift card. What is an Exhibitor Hall Pass? All attendees will receive an exhibitor hall pass. To qualify for the grand prize drawing, the attendee must have different booths initial the pass. A winner will be drawn from the completed passes that have been placed in the drawing bin at the information table in the exhibitor hall during the day. This is a great incentive for attendees to visit your booth and gives you the opportunity to sell your product or service. Again, please make sure there is someone at your booth at all times during the conference. What is the purpose of the business category on our commitment form? In addition to listing exhibitors by name on the conference program, we will also list companies by category. Each exhibitor can choose up to two categories. This will be a valuable way to quickly reach those attendees who are looking for your products or services. Is lunch included with the exhibitor's fee? How many lunch tickets are included? Yes, exhibitors are invited to join us for lunch: two tickets are included with each registration. Sponsors are allotted up to six tickets depending upon the sponsor level. Association Partners receive one lunch ticket. What time should exhibitors break down their booths? The conference ends at 3:15 P.M. We are doing the drawings during the last break at 2:00 P.M. Please do not break down your exhibit until 2:30 P.M. when there is no traffic in the exhibit hall. How can I gain increased visibility and be a part of an interactive discussion about the conference? How do I upgrade to a sponsorship? Sponsorship opportunities begin at $1,500 and all include an exhibitor booth plus much more. Feel free to contact Laura Muniz at . How can I promote the Conference? Like our page on Facebook, and Like and Share posts. Follow us on Twitter, and re-tweet posts. If you highlight the conference in an email blast, please send a copy to and .